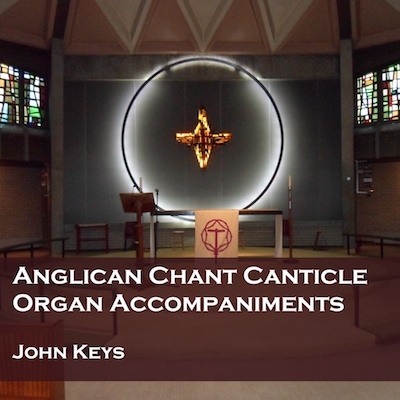 Anglican Chant accompaniments for Magnificat, Nunc Dimittis, morning canticles and two psalms. We've always thought it was impossible to provide accompaniments for Anglican Chant, as the organist usually follows the singing - but after a year's testing, we're told that, once you get used to the timing, it's perfectly possible to sing along to these accompaniments, meaning that the traditional canticles for matins and evensong can now be sung with no organist. The CD includes 10 Magnificat and Nunc Dimittis accompaniments, 2 Venite, 2 Te Deum, 1 Benedicite, 2 Benedictus and psalms 67 (Deus Misereatur) and 130 (De Profundis). There's an extra Benedicite on the download album which wouldn't fit on the CD. In the track details below we have the sets from the Parish Psalter with Chants and chant numbers from the New Cathedral Psalter (NCP). The settings are for the text from the Book of Common Prayer, with pointing from the Parish Psalter. Each accompaniment starts with a playover of the chant. We have a small number of second-hand Parish Psalters available with pointing (no music). We have a small number of second-hand Parish Psalter books available with the same pointing (no music).